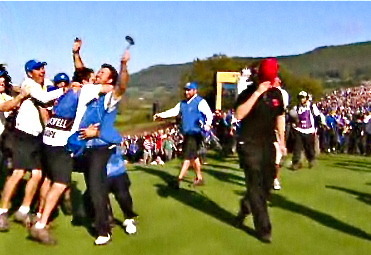 Graeme McDowell produced a blood and guts performance to add Ryder Cup glory to his US Open win. The blood oozed from his caddie Ken Comboy, who got bashed on the head by a camera as fans mobbed Europe’s match winning hero on the 17th green. It’s been the season of McDowell’s life so far, but the Portrush star has immediately set his sights on becoming the first Ulsterman to become European No 1 since Ronan Rafferty 21 years ago. Savouring Europe’s moment of triumph but already looking ahead, McDowell said: “I have obviously got to do a bit of reflecting on this one and my year in general. 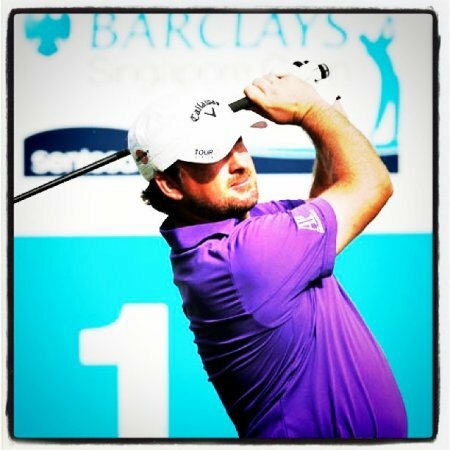 Winning the Dubai World Championship and the Race to Dubai could mean a potential $2.75m payday for McDowell, who is set to land even more lucrative contracts as a string of his endorsement deals run out at the end of the season. But money was the last thing on his mind in Wales as he came up trumps in the first Ryder Cup to come down to the final singles since Kiawah Island in 1991. In explaining why Rory McIlroy will never again call the Ryder Cup an exhibition, McDowell said: “It is not a major championship, it is not a WGC event. There is no money, there are no world ranking points. It is pride, it is playing for your country, it is playing for Europe. “It just so happened it came down to me. I didn’t want it to come down to me. I just felt honoured and privileged to have the opportunity to win the Ryder Cup. The 181-yard six iron he hit to the 16th to set up the 15 foot birdie putt that allowed Europe to put one hand on the Ryder Cup ,cranked up the pressure to unbearable levels at the par-three 17th. He said: “A lot of people have asked me to compare it to the US Open. But yesterday I felt US Open pressure multiplied by a thousand. “I was trying to do it for me. I was trying to do it for my team and I was trying to do it for Colin and I was trying to do it for Europe. The pressure was immense and that putt on 16 was the biggest putt of my life. “The 17th was mayhem after Hunter conceded the match to me. Obviously we were mobbed. “I remember looking around and seeing some friendly faces. Poulter was there. I looked up and my caddie had blood running down his forehead. I think he had been hit by a camera. It was crazy. McDowell partied until “four or five in the morning” with his team mates and their caddies before heading to Scotland for his week’s lucrative Alfred Dunhill Links Championship. Asked if he’d been capable of getting excited about a normal event, where he will bid to close the €500,000 gap on Kaymer at the top of the Race to Dubai standings, he said: “I don’t know. I really don’t know. This week was certainly a lot of fun and I have got to try and stay out of the Jigger Inn outside the Old Course Hotel. Tipped to be named Sports Personality of the Year on both sides of the Irish Sea, it’s also been the year of McDowell’s life. Barely able to speak, so hoarse was he following his screams of delight on Monday, he said: “I can’t believe it: to win a US Open, to win the Wales Open two weeks before it and come back to Celtic Manor and do what I did yesterday. McDowell’s game has been transformed since he moved back to Northern Ireland and he was as happy for his parents Kenny and Marian as he was for himself. Set to partner his dad Kenny this week, he added: “My dad was pretty lost for words. He is a pretty emotional guy and my mum was there as well. She is pretty emotional. Shane Lowry begins a new chapter of his career in Scotland today with the 2016 Ryder Cup team and the quest for a major all realistic goals for the WGC-Bridgestone Invitational champion.